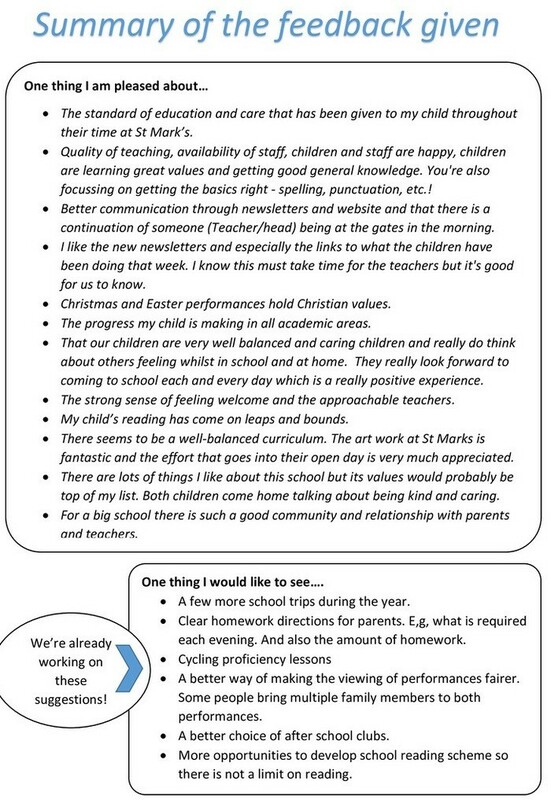 Over the past couple of weeks, we have been seeking your feedback on life at St Mark’s. 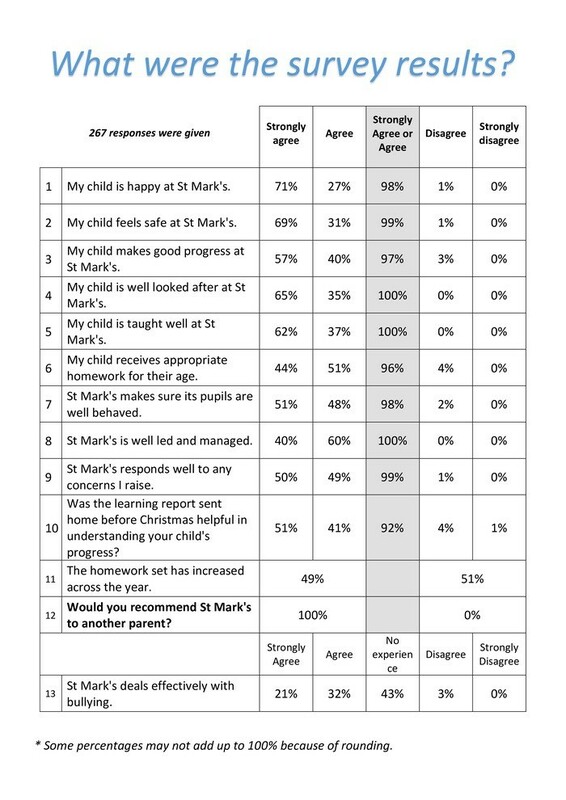 We believe it is important to know your thoughts if we are to ensure our pupils are successful. Below is a summary of some of the topics that came up. As you can appreciate, views can differ from parent to parent, and we do our best to understand and accommodate all views where possible. Communication Overall, communication was seen as a strength. 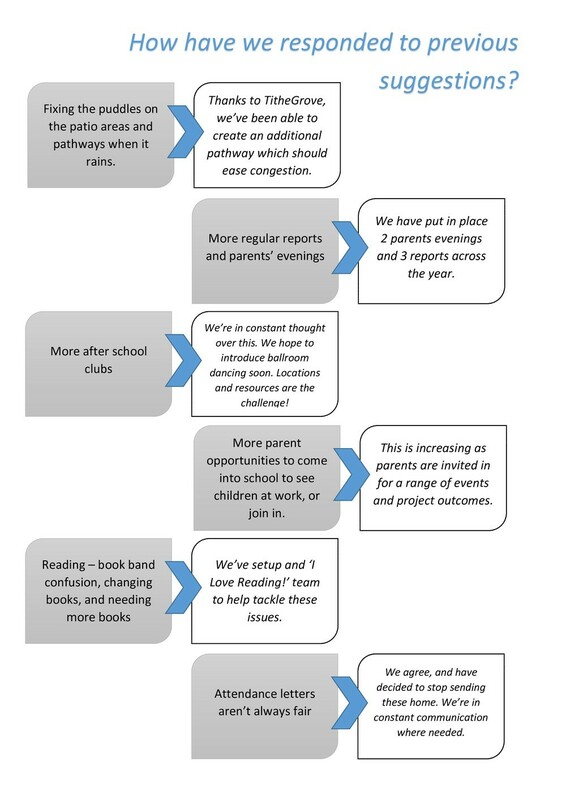 This includes conversations between teachers and parents, as well as information sent home. The website and newsletters were appreciated too. 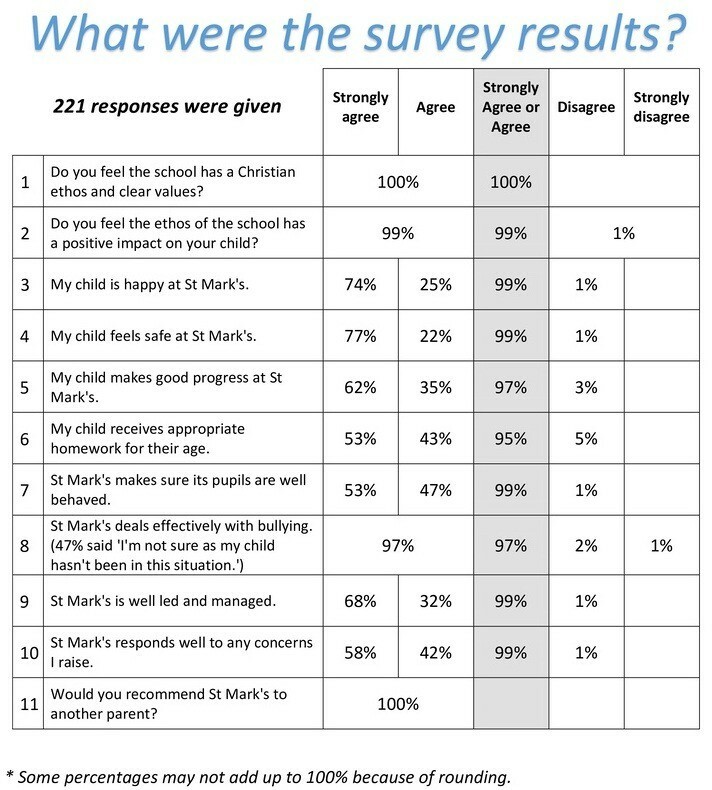 Inclusive Parents were very positive about the way that St Mark’s aims to be inclusive of all pupils, whatever their needs, abilities or beliefs. Sports Day Parents fed back that this was an enjoyable day. Competition was celebrated but not to the detriment of those who didn’t win. Team work was very evident. Some ideas were given on how to improve this further. Performances & Shows Parents appreciate the opportunities given to the pupils. Thoughts were given on the fact that they are well attended, and that sometimes there isn’t enough space for everyone. Some families bring a lot of relatives which reduces space for others. Ticketing was discussed as an option to bring in a greater sense of fairness. 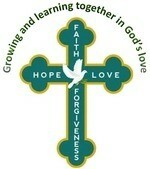 We are a large school and so this is an inevitable difficulty which we will look to improve. 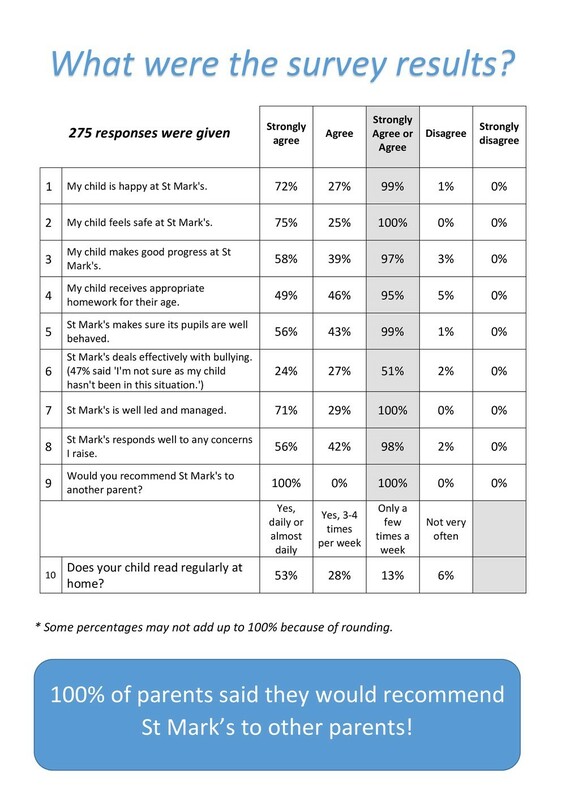 Support for pupils with emotional or academic needs Parents said how well the school looked after their children if they had Special Educational Needs or disabilities. There was also a range of pastoral interventions available, and the school was usually very quick to respond to requests or needs. Reading Bands Books are banded into colours which indicate progression. Some work is needed here to clarify expectations and understanding of what the colours mean, and how pupils progress through them without getting stuck on a certain colour band. We’ll also be looking to improve our stock of books so that there is a much greater range within particular bands. Homework Always a contentious issue! 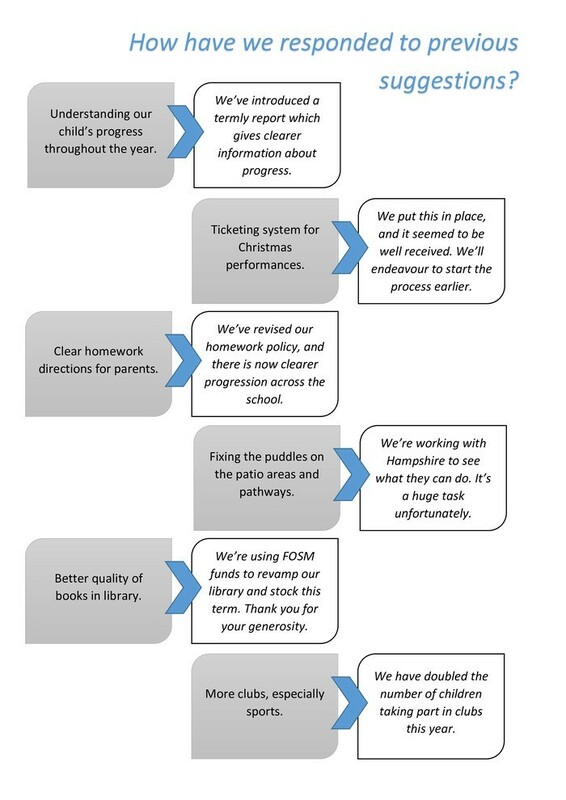 We will clarify expectations and routines, and ensure that homework given is appropriate, regular, and gives a balance of challenge and practice. 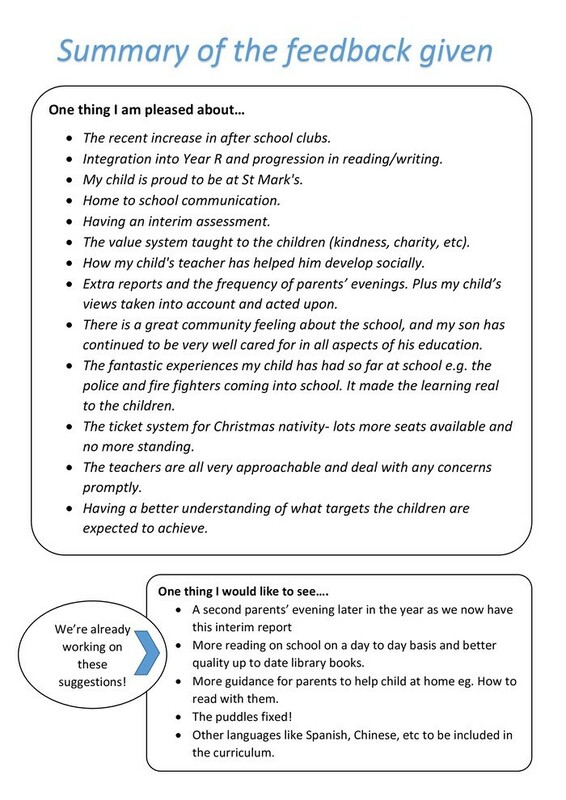 End of Year reports and class groupings Parents appreciated the amount of work that teachers put into the end of year reports and particularly valued the comments about behaviour and character. They understood the challenge in assigning pupils to classes for the following years, and suggested ways that this could be even better next year. Timings of parent open forums It was noted that many working parents would have struggled to make the meetings. 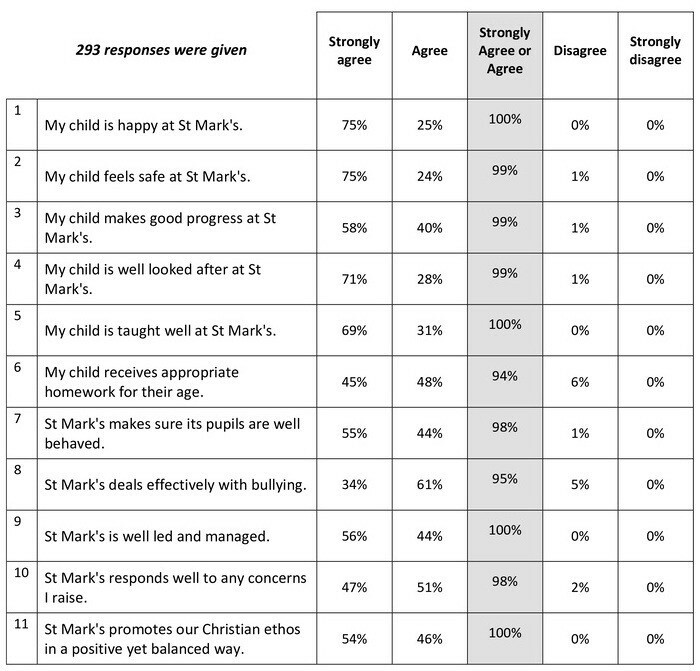 Some parents emailed to give their views, and we will do a large-scale survey over the parents evening ‘season’ in order to gather views. 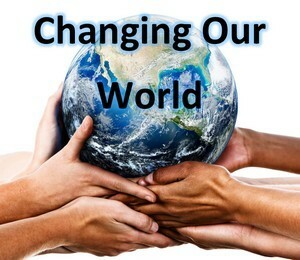 Christian Ethos Parents valued the Christian ethos and the way it is used to develop respect between each other, foster an understanding of the world and of spirituality, and to create a sense of identity and morality. Fr Michael’s informal and friendly way with the pupils and parents was really appreciated, and our core Christian values were known and respected. 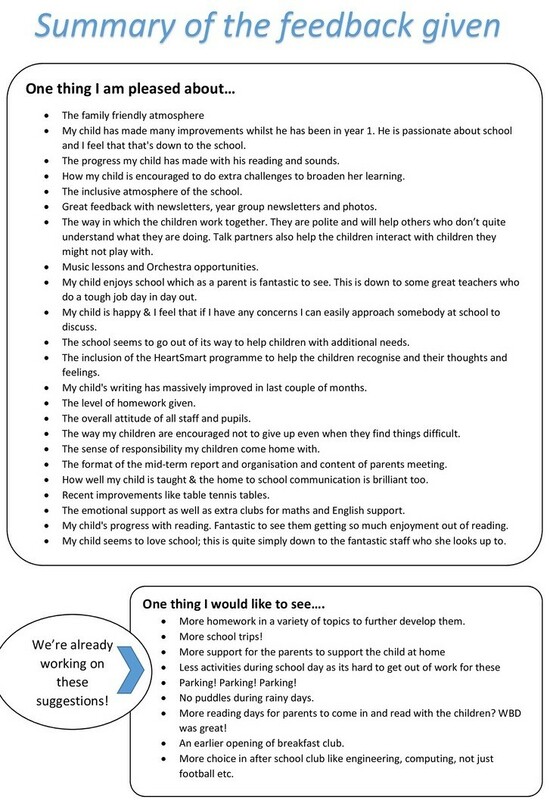 Learning Behaviours It was felt that the creation of a set of words to use to support learning behaviours would be a really good idea, and could be shared with parents so that the words could be used at home as well as school. 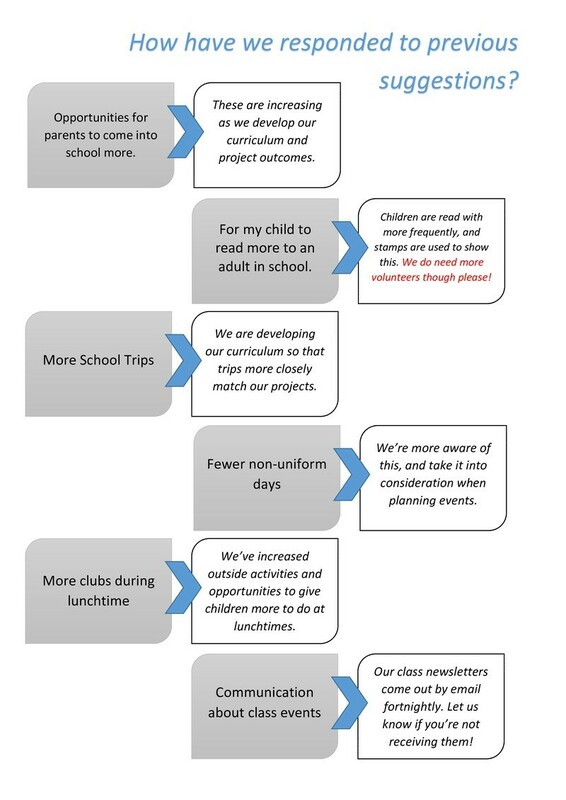 INSET days We will endeavour to give as much notice as possible for upcoming INSET days- we appreciate child-care arrangements need to be put in place. Clubs It was suggested that the school could have a broader range of clubs available, especially sports clubs. We are already working on improving this! Possible flooding Some parents raised the issue that when there is quite a bit of rain, the areas outside of the classrooms can become wet and are liable to flooding. We will investigate this and see what can be done.